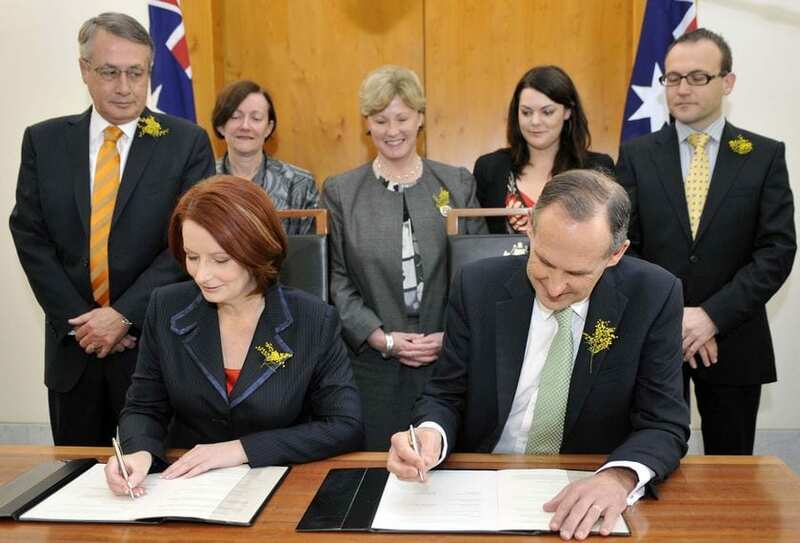 Despite my election-related criticisms of the Greens political party, the deal announced today between Julia Gillard and Bob Brown is a good one. Prime Minister Julia Gillard has agreed to a swag of demands from the Greens as part of a formal deal to join forces as Labor tries to secure a parliamentary majority. It firmly places Labor on the left-of-centre, and hopefully halts any further march towards the centre-right (a la the US Democrats). Most of the policy agreements and reforms are positive, and incidentally, many of them are ones that Labor tried to get through the Senate over the last two years but were blocked by the Libs + Fielding. It creates accountability for the Greens political party – who have been looking to get more credibility as a mature political party for some time, and now will face real scrutiny, not only by the media and blogosphere, but also from their own supporters. Now they have a formal deal which involves responsibilities as well as rights, they will face the hurdles of delivering for their constituency while navigating the politics of the possible. This isn’t really a new thing. Labor has been tackling this particular problem for over a century. I think when the dust settles we'll be realistic. The disappointment with Labor is that it DID have the ability to get some of those reforms through the parliament, and chose not to. With the Greens, they've done everything they could with the hand they were dealt – and have not sold out. They still stand for all their principles – they simply could not push them through the parliament with their one HoR member! Greens voters will realise that the limit to the Green MPs' achievement on their policy positions is one of numbers, and that the more we vote for them, the more they'll be able to do. As opposed to voting for the ALP, where we have no confidence that they'll do anything progressive regardless of what kind of a majority they get. In the last term, almost everything that Labor tried to get through the senate after WorkChoices was abolished and replaced with the Fair Work Act was blocked by the Liberals and Steve Fielding. For example, a price on carbon, reducing the limit of political donation disclosure from $10,000 to $1000, superannuation, paid parental leave, etc. Rather than try to re-write history with Labor as the bad guy, why not acknowledge that a lot of good legislation was blocked by the Tories in the Senate (and the CPRS by the Greens). Oh, you're right that Labor hasn't been able to get stuff through in its own right in the last parliament. But it still could've tried. Its refugee position was appalling. Its CPRS was a cynical exercise in wedging the Greens, with whom it absolutely refused to negotiate. It would've been a serious step backwards. As for marriage equaltiy – it could've put that up for a conscience vote at any time in the last three years, but chose to pander to bigots. Do you really have confidence that an ALP with control of both houses in its own right would really stand up for those things?